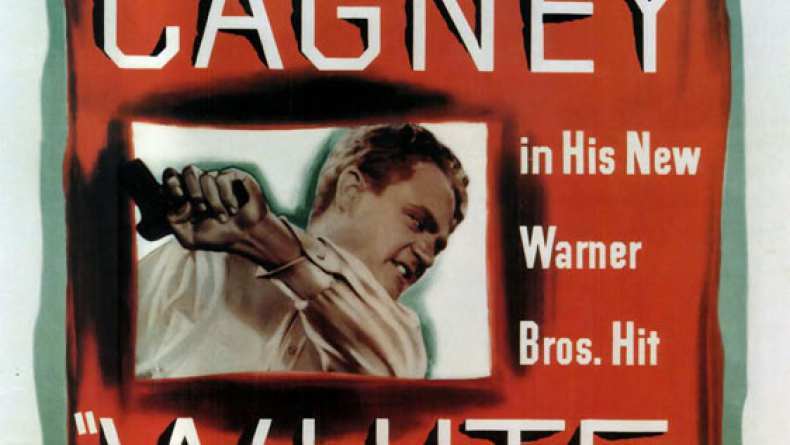 The trailer for White Heat. Cody Jarrett (James Cagney) is the ruthless, deranged leader of a criminal gang. Although married to Verna (Virginia Mayo), Jarrett is overly attached to his equally crooked and determined mother, 'Ma' Jarrett (Margaret Wycherly), who is his only real confidant. When he has one of his splitting headaches she consoles him, sits him on her lap and gives him a drink with the toast "Top of the world". Jarrett's father died in an institution. He himself is described as someone who when "he was a kid, he used to fake headaches to get his mother's attention away from the rest of the family. It worked. As he grew up, the fancied headaches became real, until now they tear him to pieces." Jarrett and his gang carry out a major robbery involving the hijacking of a train and the deaths of up to five people, including four members of the train crew and one of his own accomplices, Zuckie (Ford Rainey). With the help of informants, the police soon close in and Jarrett shoots and injures US Treasury investigator Philip Evans (John Archer). He escapes to Illinois and confesses to a lesser crime which was committed by an associate. It was done at a time to coincide with the train robbery and thus provides Jarrett with a perfect alibi. He is sentenced to one to three years of jail time. Evans is not fooled however. He allows Jarrett's conviction to go through but then sends an undercover agent into the penitentiary in order to get information from Jarrett as part of a sting operation. The agent is Hank Fallon (Edmond O'Brien), who goes by the name Vic Pardo. His main task is to find the Trader, a fence who launders stolen US Dollars on the European black market on Jarrett's behalf. 'Big Ed' Somers (Steve Cochran), Jarrett's ambitious right-hand man, has designs on both Jarrett's gang and his treacherous wife Verna. He thus asks a convict, Roy Parker (Paul Guilfoyle), to kill him. In the prison workplace, Parker arranges to drop a heavy piece of machinery on Jarrett, but Fallon/Pardo pushes him out of the way and saves his life. When Ma visits, she insists she'll take care of Big Ed herself, despite Jarrett's attempts to dissuade her. He begins to worry and decides to break out. He takes Pardo into his confidence. Pardo/Fallon suggests a means to escape that will entail a minimum of risk (he'll have the help of his colleagues on the outside who will then follow them). However, during dinner on the day of the escape, Jarrett learns that Ma now is dead and goes berserk in the mess hall. Held in the infirmary in a straight-jacket, Jarrett persuades another convict, Tommy Ryley (Robert Osterloh), to give him a gun which Ryley has managed to stash away. Holding various officials hostage, Jarrett escapes along with Fallon/Pardo, their cellmates and Parker, who is locked in the trunk of the car they use to drive out. Later, when Parker complains "It's stuffy, I need some air" Jarrett replies "Oh, stuffy, huh? I'll give ya a little air" and "creates" some air holes by emptying his gun into the trunk. Evans and his men were due to follow Jarrett and Fallon, but, on learning of Jarrett being held in the infirmary, called the whole thing off. When the convicts do escape they react too slowly to intercept them. Ma was shot in the back by Verna when she faced Big Ed. Verna wants to get away, but Big Ed is resolved to confront Jarrett and end it all. When Verna tries to slip away discreetly she is seized by her husband and is quick to convince him that Ma was murdered by Big Ed. Jarrett kills Big Ed. The gang is now double in size with the other escapees, including Fallon/Pardo for whom Jarrett appears to have a genuine liking for. He even appears to look on him as a kind of Ma-substitute, insisting that they will share the proceeds from their robberies: "I split even with Ma, didn't I?". "I'll practice up on my lullabies," mutters Fallon, but not in Jarrett's presence. While the gang prepares its next heist, a fisherman arrives at the country hideout asking to use the phone. The gang expects him to be murdered and Fallon follows him and Jarrett into the house in order to prevent any killing. In conversation, Fallon exposes the fisherman as a phony. He is in fact Jarrett's fence the Trader (Fred Clark), the man Fallon is really after. Jarrett, who never trusted any of his other accomplices with the Trader's identity, with the possible exception of Ma, makes the introductions as if Fallon/Pardo is a trustworthy as she was. Jarrett intends to rob the payroll at a chemical plant in Long Beach, California. The gang has a huge gas truck and an accomplice who works there. The plan in to use the gas truck as a Trojan Horse in order to get into the plant discreetly and steal the dough. Verna's radio has broken down and Fallon/Pardo offers to fix it. In fact he converts it into sending a signal which his law-enforcement colleagues will be able to pick up and thus track him down. He places the radio under the truck before the gang sets off. While on their way to the plant they stop at a gas station in order to have the engine checked. Fallon goes into the washroom and uses the soap in order to leave a message on the mirror for Evans. The gas station attendant alerts Evans, the T-Men track the signal given off by the hidden radio and triangulate it to the target, the chemical plant. The gang gets into the plant hidden in the gas truck. Guided by the ex-con driver they get to the office where the payroll is hidden in the safe. But the driver turns out to be Bo Creel (Ian MacDonald) who recognizes Pardo as Fallon, a cop who arrested him a few years ago (Creel was even in the prison earlier on and Pardo had to stage a fight in order to avoid meeting him face-to-face). The police surround the building and Evans calls on Jarrett to surrender. On realizing Pardo's deception however, Jarrett goes completely round-the-bend and resolves to fight it out. When the police fire tear gas into the building, Fallon manages to escape the gang. Verna is arrested in a getaway car outside the plant. Fallon also gives the Trader's present location. Jarrett is pursued to the top of a gigantic gas storage tank. His accomplices are shot by the police, or by Jarrett himself when they try to give themselves up. When Fallon shoots Jarrett with a rifle, he starts firing holes into the tank and goes up in what for him is a blaze of glory: "Made it, Ma! Top of the world!"